On Mormon Music, we feature talented LDS artists of all ages from different parts of the world whose music encompasses a variety of genres. As most of our “Video Find of the Week” posts have showcased the latest pop videos of several of our featured artists, we have decided this week to shift gears a bit and share something from the classical genre. 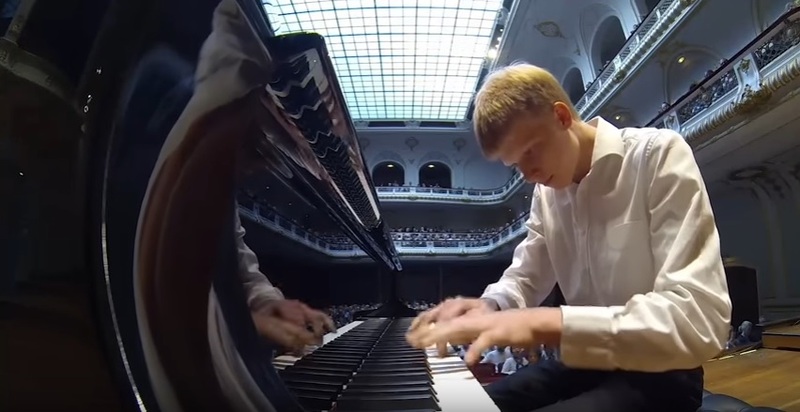 In this week’s video, Nathan captivates an audience in Laeiszhalle, Hamburg, Germany with his virtuoso performance of Prokofiev’s Toccata Op. 11 in the Finalists recital of the Steinway Piano Competition. The Toccata in D minor, Op. 11 is a piece for solo piano, written by Sergei Prokofiev in 1912 and debuted by the composer on 10 December 1916 in Petrograd. It is a further development of the toccata form which composers such as Johann Sebastian Bach and Robert Schumann used. Nathan started playing the piano at the age of four. He studied piano with his mother until he was eight. His family then moved to Southeast Asia where he studied with Anne Franc (from Belgium), and Grace Chua (from China). In 2013, his family moved to the Netherlands. He has commented that he loves playing the piano “because I love performing, and playing the piano is an extremely useful skill to have. I enjoy practicing, unlike many musical instrument players, and I also love playing things by ear like pop songs and songs from musicals on the piano.” He also says that one of his dreams is to do a video with The Piano Guys someday. Nathan has participated in numerous music competitions and is the recipient of multiple gold awards in international piano competitions throughout Southeast Asia. Such accolades include Multiple Gold Awards of the Malaysian Youth Music Festival in 2009, 2011, and 2012; Gold Award of the Kota Music Festival in 2010; second prize of the Trinity Guildhall Music Festival in 2010. He was also a finalist in the Koninklijk Concertgebouw Concours 2014 competition in Amsterdam, and a regional finalist in the 2015 Prinses Christina Concours. Way to represent! You sound wonderful.